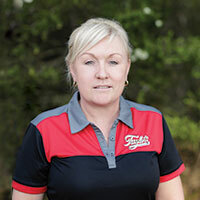 Louise has been with Taylor’s for over five years and is inspired by the passion and dedication of our Managing Director, Melissa Taylor, has for her family business. Louise enjoys working as part of Taylor’s team and is constantly challenged by the many hats she wears in her role, especially during the ‘peak’ season of December and January where 12 hour days are standard. She attributes the camaraderie of the team and their shared sense of humour as a key to meeting these demands. Prior to joining Taylor’s, Louise worked with NQX Toowoomba in what began as a temporary Receptionist position and ended up staying for almost 10 years. Her role within the company developed quickly due to her initiative and enthusiasm, and she became their Workplace Health and Safety Officer, Fire Safety Advisor, Trainer and Assessor. A discussion with her mentor Karen Steiner made her aware that Taylor’s was looking for a Supervisor / Workplace Health & Safety Officer and encouraged her to apply.